This page highlights interdisciplinary Artstor content related to the experiences, traditions, history, and cultural heritage of the African diaspora in America, including images of cultural objects, artworks, and photographs of important events and historical figures. Image credit: Unknown (American). 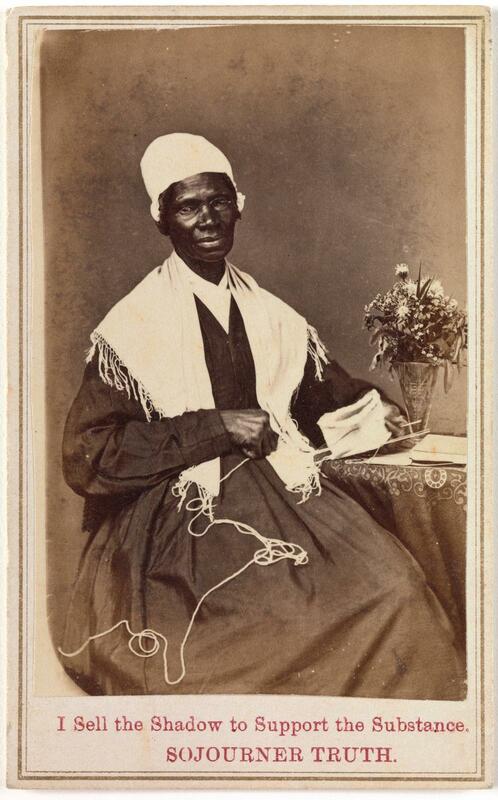 Sojourner Truth, "I Sell the Shadow to Support the Substance." 1864. Image courtesy the Metropolitan Museum of Art. Browse images by geography and select the United States. Keep in mind that geography in Artstor is based on the creator's origin, with the exception of architecture which is based on the physical location of the work. Browse museums with encyclopedic collections (e.g. The Metropolitan Museum of Art or The Cleveland Museum of Art) by classification, then by United States. Browse the collections of museums specializing in American art (e.g. Smithsonian American Art Museum or the Terra Foundation for American Art). Try these sample search terms to find images related to African American Studies. Don't forget to use the search filters, which appear in the left menu, to narrow your results. You can discover the complete Migration Series by Jacob Lawrence (1917–2000) in Artstor. Executed in 1940–1941, this 60-panel cycle documents the migration of African-Americans from the impoverished rural South to the industrial cities of the North and Midwest starting in World War I. In 1942, the series was split between two institutions, with The Phillips Collection acquiring the odd-numbered panels and The Museum of Modern Art purchasing the even-numbered works. The entire series is reunited in Artstor and may be viewed alongside photographic documentation of the installation of the full cycle for the exhibition, “Jacob Lawrence: The Migration Series,” which took place at The Museum of Modern Art from January–April 1995.